De la Theorie de la Regulation aux Complementarites Institutionnelles [The Place of Institutions in Growth Theory. Ultimately, the EPZ literature can be divided between four primary schools of thought: neo-classical theory, benefit-cost analysis, new growth theory, and the life-cycle approach, which includes Omar and Stoever's  modified life-cycle approach. As mentioned above, the other theories of growth can be grouped into the clusters of the international dependence revolution, the neo-classical free-market counterrevolution, the new growth theory and the unified growth theory. The second model is based on the well-known steady-state paradigm of economic growth theory. On the one hand, the neoclassical theory argues that a policy change has no effect on long-term economic growth and, on the other hand, endogenous growth theory shows a policy change in economy does matter. Unified Growth Theory is a parsimonious model of comparative, economic evolution based on four variables: population, technology, education, and national income. The aim is to test that whether this new endogenous growth theory is binding for the Pakistan and its neighboring counties. Although national income statistics were rudimentary and economic growth theory had not yet been developed, Keynes boldly predicted that "the economic standards of life in the progressive Western nations one hundred years hence would be between four and eight times as high [as in 1930]" was on target, although perhaps not for all the right reasons. Finally, more surprising and very perceptively, Walsh discusses Pasinetti's growth theory as the best alternative to the sterility of neo-classical growth theory. 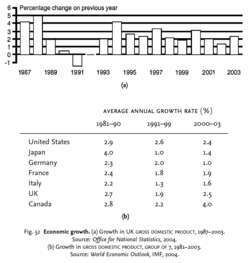 McCloskey takes particular relish in demolishing a more recent, much-debated growth theory. Model used in exogenous growth theory consists of a production function equation in which economic output was the result of the sum of two inputs: labor and capital (Mankiw, Phelps, & Romer, 1995).